Telza, the mother of Rabbi Moshe Rivkas. My article "Ancestry of the Gaon of Vilna – Descent from King David" was published in "Avotaynu" Volume XXI, Number 3, Fall 2005. Further research provides a possible explanation for the confusion between Moshe Rivkas' father's identity as Naftali Tzvi Hersh Sofer of Prague or Hersh Fass of Krakow. "Little is known about the Gaon's female ancestors. There are two versions as to the identity of Naf­tali Tzvi Hersh Sofer's wife. 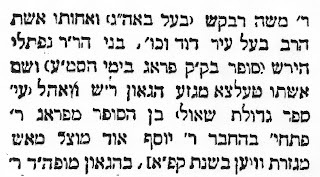 Shapira refers to Naftali as Tzvi Hersh Fass and records his wife's name as Rivka, a daughter of Natan Mandel, son of Meir of Krakow. But Hersh Fass lived in Krakow, whereas the father of Moshe Rivkas, Naftali Tzvi Hersh lived in Prague where he held the position as Sofer (scribe) of the Kahal.i Hersh Fasi held a position as Parnes Umanhig (a community leader) in Krakow. 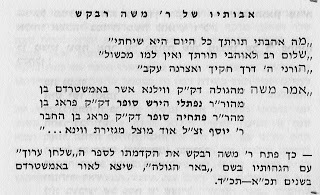 Kahana lists the children of Hersh Fass but the name of Moshe Rivkas is not included. Naftali Tzvi Hersh Sofer died in Prague in 1601, whereas Hersh Fass is recorded in the Pinkas Hakahal (a community register book) in 1632. Therefore it can be seen that Shapira has confused two individuals. A possible explanation for the confusion may be due to the fact that Fass ' son Leib was the father-in-law (by his first marriage) of Rabbi Gershon Ashkenazi of Nikolsberg and Vienna (1615-1693, author of Avodat Hagershuni) who referred to Moshe Rivkas as his “Mekhutan” (meaning that their children were married) in Gershon’s approbation to Rivkas’ Be’er Hagolah"
His wife was Mrs. Telza – of the root of the Gaon Reb Shaul Wahl, and apparently he was “His Honor Hirsh the son of the master the honorable Petakhiah Sofer, tender in years, Sofer son of Sofer, who passed away in Elul 5361  in Prague. 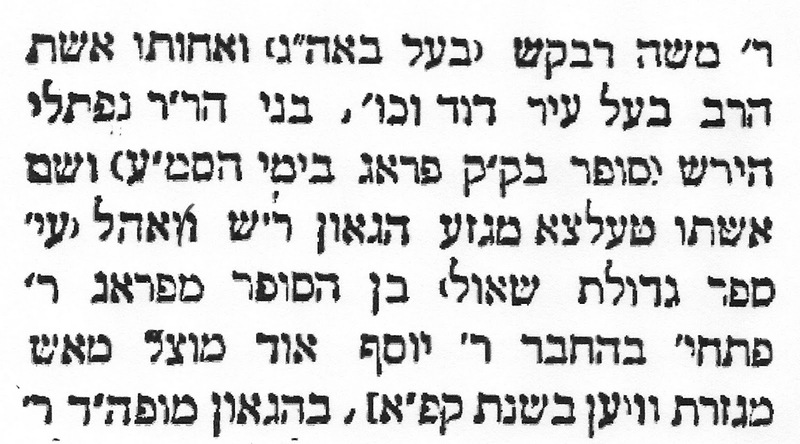 Moshe Rivkas' father was clearly identified by Moshe Rivkas in his introduction to "Be'er Hagolah" as Naftali Hersh Sofer of Prague who died in Prague in 1601. Moshe Rivkas was then a young boy of five. His mother was a young widow aged about twenty one. It is reasonable to assume that she remarried. Hersh Fass' first wife Rivka, daughter of Natan Mandel died in 1606. She was the mother of Leib Fass whose daughter married Gershon Ashkenazy (also know as Ulif and Fass, 1615-1693) who is referred to by Moshe Rivkas as "Mekhutani". In modern times this term indicates the relationship between the parents of a married couple. In the rabbinic literature it indicates any relationship by marriage. Hersh Fass' second wife was "Teltzel" who managed the considerable fortune left by her husband. Details of Mordekhai Krasnik, referred to by Moshe Rivkas as "She'ar Besari" meaning a blood relative state that Rivkas lived in Krakow "among his relatives" before he settled in Vilna. 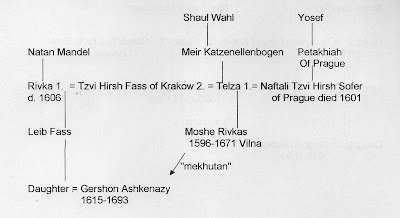 Since Fass' first wife died in1606, and since Moshe Rivkas' father's wife, also claimed to be Telza, was left a widow in 1601, it is possible that she moved to Krakow where lived a relative Mordekhai Krasnik, and there became the second wife of Hersh Fass. 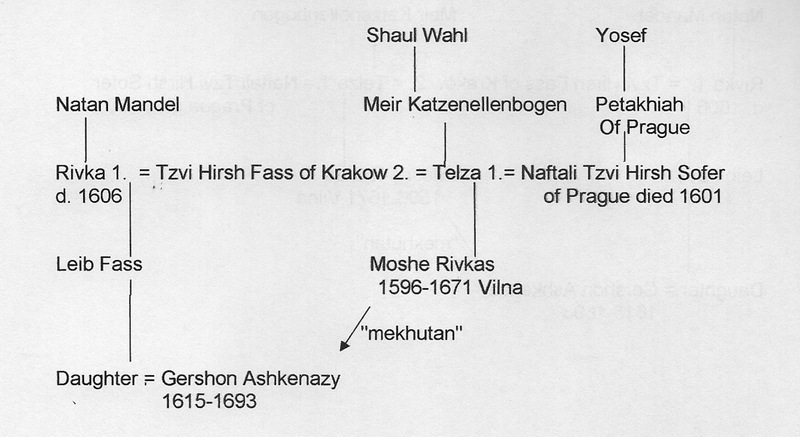 Thus the apparent contraditions in the sources as to the identity of Moshe Rivkas' father as either Nafatli Tzvi Sofer of Prague or Hersh Fass of Krakow, arose from the possibility that Fass was Rivkas' step-father from his mother Telza's second marriage. This also explains the term "mekhutan" used by Rivlas to refer to Gershon Ashkenazy who was a son-in-law to Rivkas' step-brother Leib Fass. 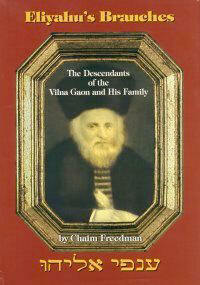 1) Eliyahu Landa's notes on the family of the Vilna Gaon do not mention the above relationships. 2) "Sefer Yukhsin" by Ch.Y.D Weiss (2007) confuses the relationships. 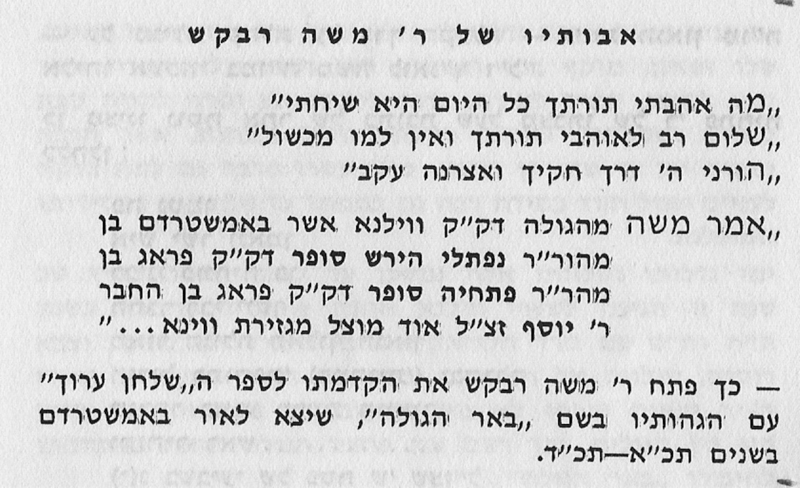 3) Gershon Ashkenazy in his book "Avodat Hagershuni" refers also to Rabbi Shabtai Hakohen the "Shakh" as "mekhutni". This may be explained by the fact that Ashkenazy's father-in-law Leib Fass had a sister who married Moshe Leizers, a nephew of Moshe Isserles, the "Rema", whose great-great-grand-daughter was the wife of the Shakh. Dembitzer, Chaim Natan, Krakow 1893.